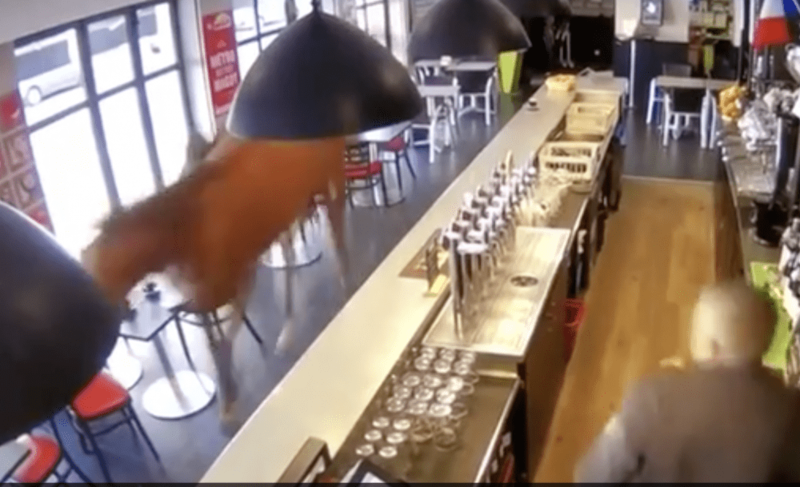 The old joke about a horse walking into a bar actually happened last week in France. Patrons at a sports betting pub near Chantilly racecourse can be seen relaxing and enjoying their drinks when all of the sudden they start running for cover. The next thing seen on the security camera footage is a tacked-up horse galloping and bucking through the bar. Turns out, the filly was saddled for a race, dumped her rider and bolted, winding up at the bar. No one was hurt in the incident, including the horse. Stephane Jasmin, the owner of the Chantilly PMU bar, said: 'She pushed the door open, and raced straight for the betting corner. This entry was posted in NL Article, People and tagged chantilly, French racing by Paulick Report Staff. Bookmark the permalink.